Watching ‘Inside Out’ this week my husband and I literally experienced an emotional rollercoaster. We don’t go to the cinema often and when we do we are usually the only ones in the theatre as we choose an afternoon showing. The audience this time was around 20 and included children, age range between 5 – 14 and grandparents who were accompanying them. The film is great and caters for that full range of customer. The animation is slick, colourful and the characters easy to befriend. Riley, a happy 11 year old girl who has her world turned upside down when her parents move the family to a new city. The film is the story of how her emotions of Sadness, Joy, Fear, Disgust and Anger come to life and help her cope with this event . As Riley is a happy girl, Joy is the key emotion that leads the others. She tries to marginalise sadness as she thinks Riley is better off without any sadness in her life. Through a series of disasters such as the furniture van being delayed, having to make new friends, not being picked for the hockey team Riley has an emotional meltdown and it soon becomes clear that it’s only by Sadness and Joy working together that they can turn the whole thing round for Riley. 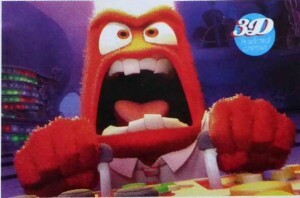 volcano when he was really angry. The deeper level aimed at the adults was interesting. I had never really thought about the interdependence of emotions and had regarded them more exclusive. Having characters based at ‘Headquarters’ which is her conscious mind and seeing them working with core memories in the forms of balls which were stored away, you could see how the whole memory process hangs together. It definitely was ‘inside out’. Our trip to the cinema not only gave us a great afternoons entertainment but I made a great discovery. Did you know that some cinemas cater for autistic customers? I was so impressed so picked up a leaflet to share. As we don’t usually go to children’s films, we were quite struck with the flagrant marketing of all the trailers and adverts aimed at youngsters (and at the adults presumed to be accompanying them) and pity those grown ups who would no doubt be inundated with requests for things once the film was over. Are you a cinema goer? Did you know about this facility for those with autism? If you know someone who has this condition, would they go to the cinema? I love going to the cinema, but had no idea that any theaters were offering accomodations for cinema-goers with autism. I abhor trailers, as I dislike knowing excessive amounts of info. about upcoming movies! I usually close my eyes during the trailers! I’d love to see Inside Out–I’ve heard many good reviews including yours! We are not movie-goers. But I do love the idea that some of your cinemas cater to those with autism. Isn’t it brilliant! I was so impressed. Definitely one that grown ups can go to without a little one in tow! Sounds like a wonderful bit of writing, that story/film. The writer spent some time with a psychologist I think to get it right.